Krispy Kreme Doughnuts Japan has revealed a new product as part of its Krispy Kreme Premium doughnuts. Named the Krispy Kreme Premium Gorilla, this cute doughnut will be sold at the JR Nagoya Takashimaya branch from April 17 to June 4. The Krispy Kreme Premium series is sold only at this branch of Krispy Kreme. Made with much time and effort, they are cake-like in their form and texture and are filled lavishly with delicious ingredients such as whipped cream. 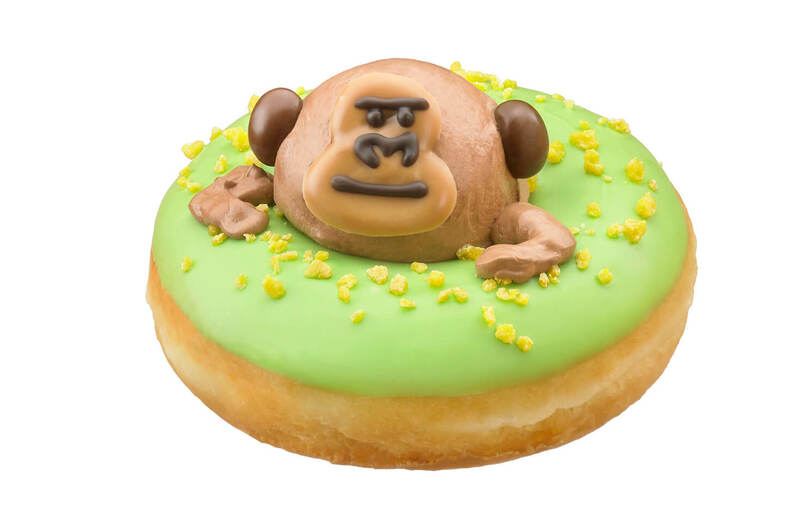 Their new gorilla doughnut is coated in bright green vanilla flavoured chocolate. Sticking its head out of the centre of the doughnut is an adorable gorilla made from fluffy chocolate whipped cream. Sprinkled around him are butter crunch pieces to finish the doughnut’s grassland-like look. The gorilla’s face is made from caramel chocolate and dark chocolate while his ears are made of coffee bean chocolate. Underneath the gorilla is a banana sauce, every gorilla’s favourite flavour!